“Lean into me,” he said. I hesitated, suddenly too conscious of the sharpness of my shoulders, the hunch of my back, the stickiness of my skin. It was a lesson in finding spaces: finding the curve of someone’s neck to nudge your head into; finding the end of someone’s reach to extend with your own fingertips; finding a space to coexist, even if only for a brief moment. This has been my relationship with Aotearoa. It’s been nineteen months. At times I hear him whisper in my ear, inviting me to settle, to nestle myself into his embrace. I feel warm. I feel like a part of me could be at home here. But then, like wind against stone, I realize that I’ve bent myself around him and “the stone wall / I lean upon spins me / wordless and silent” once again. Suddenly, the stone is too cold to lean against. Suddenly, it is too hard. Suddenly, I no longer want to bend. I want to travel straight. I want to pretend that I know the path that I am meant to follow. I want to decide. It’s always been my nature to resist: to struggle, to fight against stone, to pound my fists against the surface, knuckles bleeding, fingers bruised. I’ve never been one to open, not completely anyway. But Aotearoa taught me. The journey up to the stone was smooth. Leaving my Hawaiʻi and moving was the easy part. It was trying to determine what to do when I got there that took time. The truth is that when we embark on a new journey, filled with excitement at the novelty of it all, we eventually find ourselves lost, without grounding. That’s when we begin to question ourselves, to dig deep searching for purpose, for direction, for guidance,… anything. It was in my moment of desperation that he whispered to me, insisting I lean into him. Abandoning my normal reserve, my instinctual hesitation and fear, was a journey in itself. And it was when I finally released the need to determine my path—when I learned that the wind is meant to bend, meant to twist and twirl, and circle back around—that I was able to flow, allowing the stone to send me in unexpected directions. I leaned in, resting more of my weight on his chest. And slowly, I worked myself into spaces, into crevices and pockets that seemed created just for me. Then, like a warm breeze on a sticky summer night, I wrapped myself around him, my limbs relaxing. Wordless. I was in him. Wordless. I reached for the stars beyond my ceiling. Wordless. I found the universe within. Categories: Reflections, Travel | Tags: connection, migration, poetry, simon ortiz | Permalink. 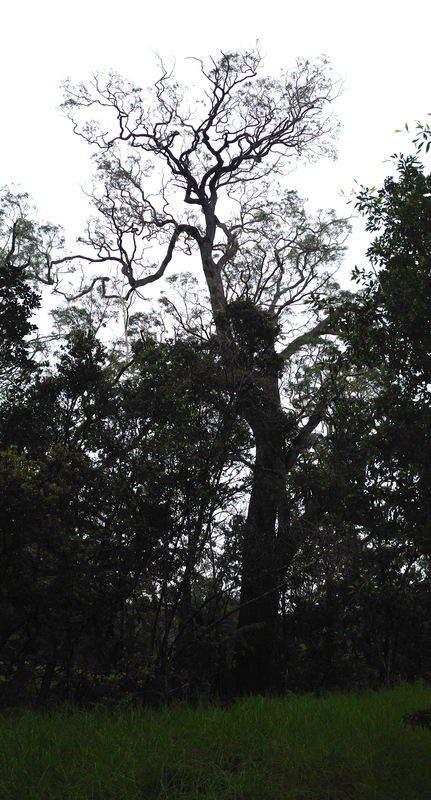 A koa tree in Keauhou Forest, Kaʻū. I’m stump-ed. Literally! A part of me no longer knows up from down, sky from earth, tree branch from taproot. What once had definition is beginning to seep into new spaces, blurring boundaries. And I like it. Now, before you stop reading, completely bewildered, let me explain. Perhaps starting at the beginning—or is it the end—will provide some clarity. Well, technically, it started twenty-one years ago. And as long as we’re being honest with ourselves, we may as well admit that it actually started generations before that. But, we won’t go there (at least not yet). For the time being, yesterday seems a bit more manageable. That’s when I went to the forest. I followed behind a group of giggly 9 and 10 year olds who were so happy to be outdoors rather than in the classroom that no amount of rain, mud, or slipping and sliding could have dampened their excitement. In fact, for our children, it probably heightened it. With shoes coated in mud and clothes scented with rain, we walked along wet trails, allowing the trees to determine our path. At the head of our group was a man who had walked those trails before, twenty-one years before to be exact, in search of a canoe. But that slight change in perspective isn’t what got me stump-ed. Let me continue my story, this time starting more than two decades ago. A group of men once walked through the same forest. Yet, twenty-one years ago, the group of 9 and 10 year olds who giggled through the trees yesterday hadn’t yet been born. In fact, back then, I was the 9 year old, filled with the same innocent wonder. 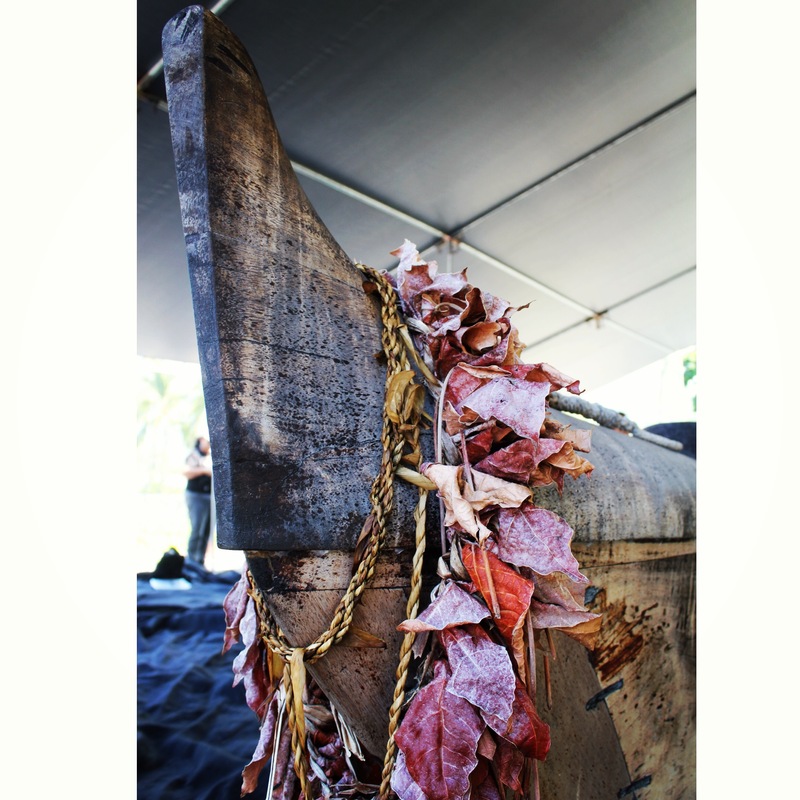 And it was at 9 that I first saw the canoe, the one that these men brought out of the forest and shaped with stone tools, the one they lashed with coconut sennit and rubbed down with kukui nut oil, the one they named Mauloa. It is this canoe, twenty-one years later, that continues to carry their story. Yesterday, I hiked into the forest in search of the root of that story. Since the tree had tumbled over years before, we searched for its stump, for the part that symbolized its continued connection to its place of birth. I wanted to travel back to the beginning, to where it all began. But, we never found it. And for reasons that I am only beginning to understand, perhaps we never needed to. Because like the base of that tree, I’m stump-ed. In fact, we’re all stump-ed. Generations ago, a seed sprouted. As it grew upward, it also grew downward: branches spreading across a stretch of blue sky, creating a canopy of dreams; and roots reaching through layers of soil, seeking nourishment for those dreams. When these men came upon the tree, standing tall, birds circling but never landing, they saw their canoe. 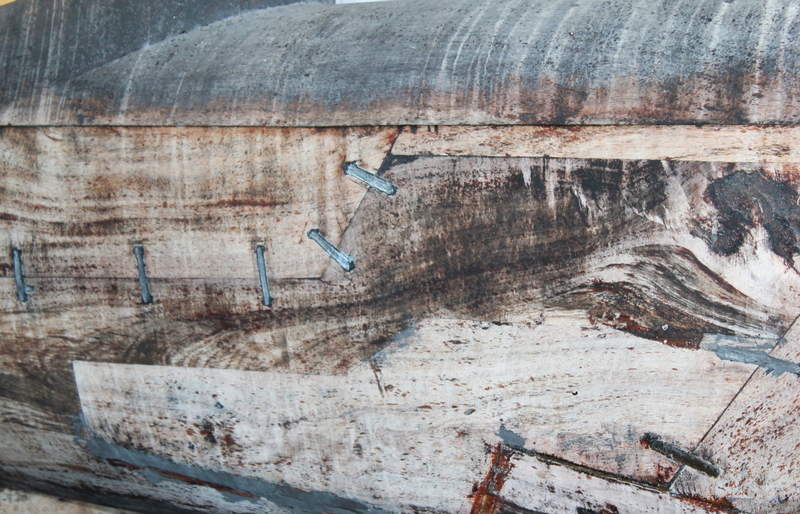 With stone tools, they chipped away at its trunk. Red appeared beneath its bark while chips flew, cutting their skin. They both made a sacrifice, both bleeding for their cause. When the tree fell, and when the canoe was hauled to the shore, the stump remained. And with it, so did everything below the surface: a network of roots attached to the ground, attached to a specific place adorned with lehua and scented with maile. We searched for the stump only as a means to locate its roots. But, as we searched and slipped through the forest, walking a circle, eventually looping back to the beginning, we realized we didn’t need to. Somewhere beneath our feet, beneath our mud-coated shoes and our rain-soaked jeans, was a system of roots, one that once nourished the tree above it. We walked the same land, looked up at some of the same trees. We knew we were in the right area, and in the end, we didn’t need to see the stump to be nourished by its roots. Are you stump-ed yet? Perhaps this will clarify. You see, our ancestors were masters of language, masters who recognized the connections between things that often seem disconnected, who knew that sometimes up is down, that sometimes sky is earth, that sometimes the tree branch is the taproot – one and the same, depending on how you look at it. In Hawaiian, the word for root is aʻa. It is the same word for vein, for artery, for tendon. Figuratively, it is the same word for womb and the same word for offspring. ʻO ke aʻa kēia. This is the root. ʻO kaʻu aʻa kēia. This is my child. He kama au o ke aʻa hoʻokahi. I am a child of the same womb. We come from the same source. Perhaps the same root that nourishes the tree and carries water to its branches is the same vein that carries blood to my heart. The same root that burrows deep into the earth is the same root that will travel over it. Aʻa grow upward as offspring as they also grow downward as roots. At different points in our lives we are both fed by aʻa and we become aʻa, nourished by that which is older and tasked with the responsibility to nourish all that will come after. And through it all, we are always stump-ed. And we should be so, happily. We are but the physical reminder of roots, deep roots, ancient roots. 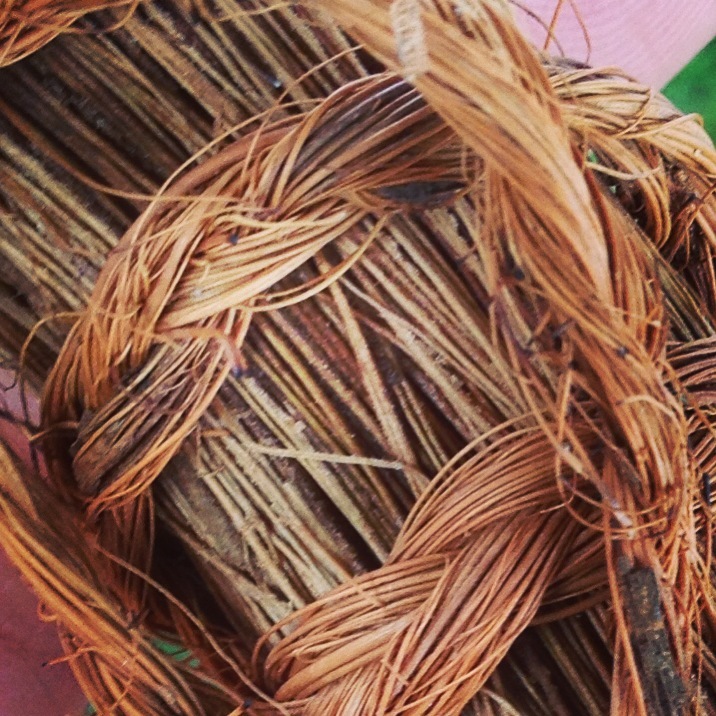 Our ancestors may not be visible, but they are there, a complex weave of aʻa, continually spreading underground. Without them, our land, our culture, and our people would erode, eventually drifting aimlessly out to sea. With them, we can travel far and wide, always carrying the sense of being rooted, knowing that we will always be stump-ed: a piece of ourselves will always be left back, grounded in the place that our ancestors’ roots are spread, holding the foundation of our identity together. No matter where we go, there is a piece of ourselves that is, and will always be, stump-ed. It is the piece of ourselves that remains completely rooted to all that came before while the other part of ourselves travels in new directions. At some point in time, we’re all canoes standing in the forest, as the offspring, the aʻa, of those below the soil. And at some point, we all tumble over to begin a new journey. But that doesn’t disconnect us from the site of our roots because a part of ourselves—even when not seen physically—will always be stump-ed there, a reminder of that piece of earth to which we will always belong. 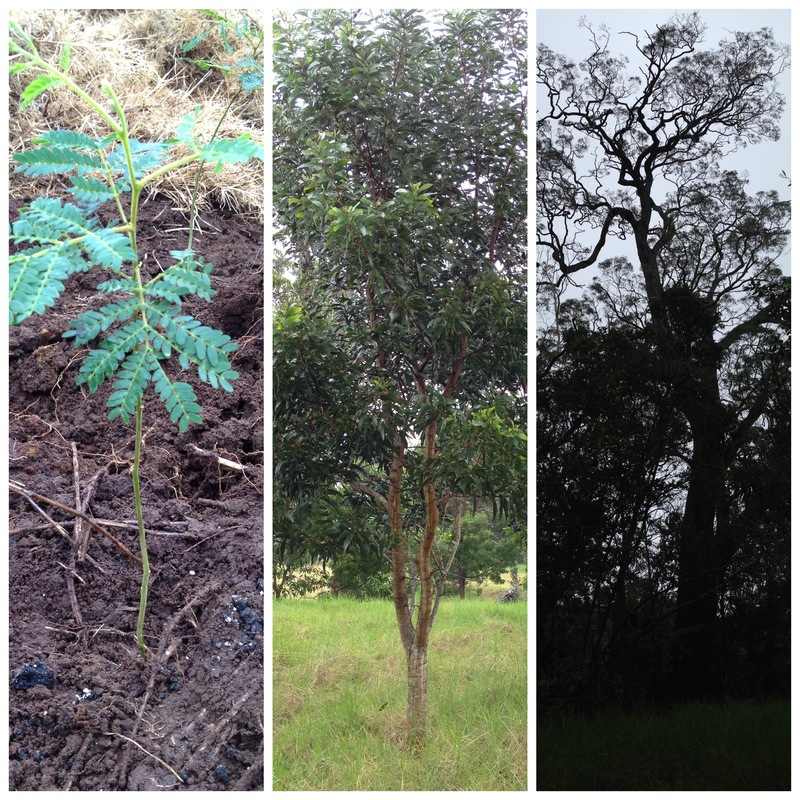 Koa trees at multiple stages. This line comes from a canoe chant as recorded in He Lei No ʻEmalani: Chants for Queen Emma Kaleleonālani, p. 268. “See the forest for the trees” is a popular idiom that refers to seeing the bigger pictures rather than just focusing on the details. To take a step back allows one to see so much more than if he/she were to focus solely on one thing alone. “Seeing the forest for the trees” or “for the canoes” allows us to see the interconnectedness between things. This passage comes from Hauʻofa’s essay entitled “Pasts to Remember” from the book We Are Oceania: Selected Works, p. 76-77. Categories: History | Tags: canoe, forest, language, perspective, roots | Permalink. Like the fruit of the noni tree, it’s bumpy and it’s blemished. It ripens slowly: born green, turning yellow, and falling when white. We’re often intrigued by noni, by its peculiar shape and sour smell, and are sometimes even drawn to it because we know, like any other medicinal plant, that it has the potential to heal us. Yet, we still turn away from it, our noses in the air, because smashed, smeared, and sour fruit can be hard to take. Like noni, history is messy. But eventually, we have to face it—even smell it, taste it, and rub it on our skin—so that we can heal and move on. My “eventually” came sooner than I expected. Yesterday I spent five hours seated under a noni tree. Flies swarmed around my feet, attracted by the reek of rotten fruit, smeared across a mix of sand and soil. I was positioned on a stone near its trunk. I leaned my back against it, my hair softly brushed by the large and dark leaves that danced above my head. While I probably wouldn’t have picked this location myself, I was led to it. Across from me, seated just beneath the extended stretch of noni branches, on the edge of hardened pāhoehoe lava, was the one who led me there: a man, a storyteller, a canoe builder. I had come to hear his story and he had come to smear it across the ground before me: every dirty and messy bit of it. It was the messiness that I was least prepared for. Yet, with time, it was precisely what made me salivate. The longer I sat among the noni, the more I wanted to taste it. The more the smell excited my senses. We all have versions of history that we favor over others, especially when it comes to the lives of our ancestors. It’s simply easier to accept the beautiful, courageous, and honorable actions of those who preceded us. It’s easier to accept the clean, tight, and bundled-up version of history, the one presented to us like a woven basket carrying only the best crops, ready to be consumed. It’s much harder, on the other hand, to accept that our ancestors made mistakes, that they did things that warrant embarrassment, and that they were human. We often position them on the highest branches and then are always disappointed when, like ripe noni, the reality of some of them falls to the ground and splatters at our feet. Yes, it’s much harder to accept the messy version of history: the one that appears smashed and smeared, the one that smells. Yet, the smellier is sometimes the better. 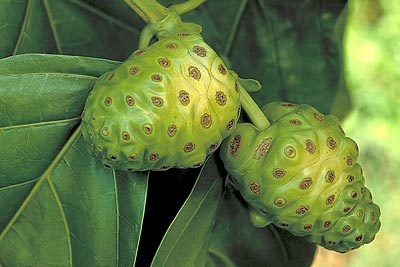 The ripe noni fruit, when combined with salt, is a potent combination. It may stink, but it heals. History is the same. It’s like the day I learned that I am the descendant of both anti-annexation petitioners on one side of my family and pro-annexation lobbyers on the other. My own personal history is messy! While I could cover-up the truth, burrying the stink beneath a layer of dirt, forever hiding the reality of my existence, I simply cannot deny my ancestry. I cannot escape who I come from. One of my ancestors lobbied for the annexation of Hawaiʻi, an event that forever changed the course of history in these islands, an event that devastated many, including my other ancestors who petitioned against it. In 1898, the two sides of my family stood opposed, not knowing that generations later, I would be here: a descendant of both of them, a descendant of people who may have been enemies. While it would certainly be easier to ignore the actions of an ancestor who, at one point in history, ignored the wants and needs of the Hawaiian people, the simple reality is that I can’t change the past. All I can do is face it. All I can do is take it in and own it. Like salt rubbed on a fresh wound, I have to accept it. That doesn’t mean that it doesn’t hurt: that history doesn’t hurt, that truth doesn’t hurt. It does and sometimes it’s excruciating! But the pain is necessary. It is necessary if we ever want to heal. Facing the realities of my family history made me also face my responsibilities. Now knowing my history, knowing every messy bit of it, I have an even greater sense of obligation to my people. Yes, it’s messy. But, in the messiness of my own history, I’ve found purpose. My five hours under the noni tree, similarly, made me face the ugly, the smelly, and the dirty parts of another story. I had arrived prepared to receive the pretty version. Yet, the man who sat before me positioned me on a small stone that dug into my legs, like a five-hour reminder of the discomfort that comes with learning truths. He did not speak of the reawakening of our people and the revitalization of old customs in romantic language. Instead, he spoke of the dissension, the turmoil, and the anger that sometimes comes with such efforts. These realities often get buried, hidden, and forgotten. Yet, to forget that part of history is to risk repeating it. It is no secret that some of our most profound lessons come from mistakes, from struggle, and from the moments spent agonizing, or crying, or fighting. Therefore, why deny ourselves the lessons that come with the tough, the difficult, and yes, even the stink? As my storyteller continued to reveal the fruits of his history, I found myself wanting more. The longer I sat there, and the more he told me, the more noni I wanted to eat. It was deliciously sour and delectably bitter. I partook of it and felt it run through my body, cleansing it. Then when we stood to leave, I peeked out from under the noni tree. My eyes scanned the site of our conversation: the solid stone walls; the thatched house in the distance; the appearance of carved, wooden figures standing tall; the reality of tourists walking over a deeply storied landscape, treading on a history unknown to them. My gaze then shifted back to my own feet, surrounded by small flies swarming over smashed fruit. It was then that I realized that I’d rather walk knowingly into a mess than be an unconscious traveler. 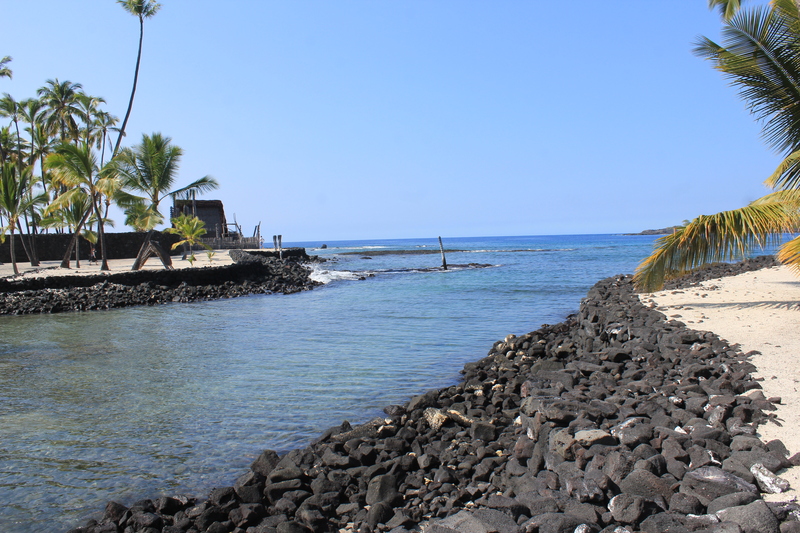 The site of our conversation: Hōnaunau, Kona, Hawaiʻi. As I finally left and parted ways with the one who led me there, I looked out once again. My five-hour conversation had changed the landscape. The sky had new color, the soil and sand beneath me had new layers of depth, and the noni tree had a new smell, a sour smell that I now appreciated. My senses had changed, having adjusted to new truths. 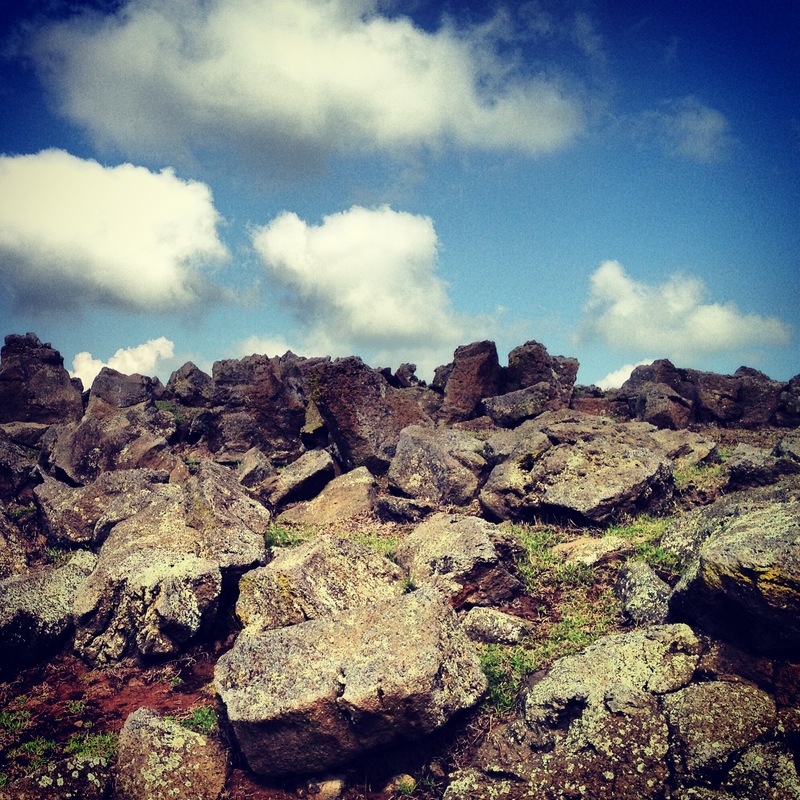 I walked away, the stone that I sat on leaving temporary indentations on my thighs. I looked down and smiled. History is indeed messy and sometimes, it hurts. Yet, I’d rather smell it, taste it, and yes, even smear it on my body and wear it, than live with parts of myself concealed. Categories: History | Tags: ancestry, difficulty, family, healing, stories | Permalink. Many great voyages have started with loss. The bow of a canoe. Take Moʻikeha, an ancient chief from Moaʻulanuiākea, for example. He was so distressed over his loss that he ordered his people to prepare his canoe to sail into “ke kai kāwahawaha o ka Moana Pākīpika”, into the furrowed waters of the Pacific Ocean. He spent weeks at sea, perhaps hoping he’d find something, or someone, to fill a void, to occupy a space: a gaping hole, left empty. I suppose coming home one evening to find that his wife, Luʻukia—so enraged at rumors that he had been defaming her in public—had decided to bind herself from the waist to the thighs, was enough to drive him across oceans. Oh, what people will do when their desires cannot be fulfilled! It is said that the weave around her was so intricate that the ends of the rope were impossible to find: no apparent beginning, no visible end. Only those who bound her knew how to undo it. This, of course, made it impossible for Moʻikeha. Although he pleaded with her to tell him what he had done wrong, she refused. And so his desires lay bound and concealed in a tight weave around her “wahi hūnā”, her “hidden place”. Without any access, and without being able to find the beginning or the end of his quarrel with Luʻukia, he left. He departed his homeland in Tahiti and set out on an epic journey. But to focus on the loss is to miss the point of the journey. Moʻikeha may have been distressed. In fact, he may have been extremely frustrated, outraged even. Or, like many who came before him and like many who came after, he may have simply been heartbroken. She surely must’ve been quite a woman! To fixate on what he had lost, however, or to focus solely on his hopes and dreams that were then lashed down beneath a tight weave of rope, would be to ignore all that happened afterward including his arrival in Hawaiʻi and the life he created there. The same can be said for us. Many of our voyages begin with loss. Yet, they never have to end there. If we sail through the history of centuries past, we see loss everywhere: loss of language, loss of customs, loss of knowledge, loss of story, loss of identity, loss of land, loss of voice. And yes, we even see disconnect. Like Moʻikeha, we sometimes see the things we desire most locked away from us. At times, we even see ourselves bound tightly to a future that we don’t want: no beginning, no end, no visible way out. It’s easy to be overwhelmed, disheartened; it’s easy to give in to the loss! But when we cease trying to untie the knots, searching for the ends of a rope that will always be too intricately entwined to find, we realize that we don’t have to. We learn that there are other ways, other avenues, other paths. We accept that the lashing has no end and we stop searching for it. We stop seeking what we think we need and we instead try something new. We ready our canoes for a new voyage. What we find along the way is the power to unlock our own potential. Sometimes binding can’t be untied. But sometimes, we can cut through it, slowly and carefully, unveiling all that lays beneath. It’s done one strand at a time. But each strand has meaning. Each leg of the voyage has purpose. Loss doesn’t have to be the departure point and the destination. Terms like revitalization, resurgence, reawakening, and remembering, terms that are so often associated with our recent history, each stem from some sort of loss. Yet, regardless of what motivates the journey, it is where that journey takes us and the ways that it fills spaces in our thinking, in our feeling, and in our knowing that matters most. Even when a voyage begins with loss—whether it is loss experienced at the refusal of a loved one who’s decided to bind joy and delight in a complex weave of rope, or loss of another sort—it certainly never has to end there. Sometimes loss is precisely what we need to push us into the furrowed ocean of our own potential: vast and expansive. And it is from there that we can land again. There are many different versions of this story. This particular version comes from Abraham Fornander’s Hawaiian Antiquities and Folklore, p. 112-154. This reference to the Pacific Ocean comes from the version written by Olopananuiākea, printed in a Hawaiian language newspaper, Ka Holomua, in 1913, vol. 1, issue 7. A term used in Fornander’s version, p. 113. Categories: Exploration | Tags: discovery, loss, oral traditions, stories, travel, voyages | Permalink.